The Firelands is a 10 and 25 player raid instance, the entrance of which is located on the north-east side of the Sulfuron Spire in Mount Hyjal. 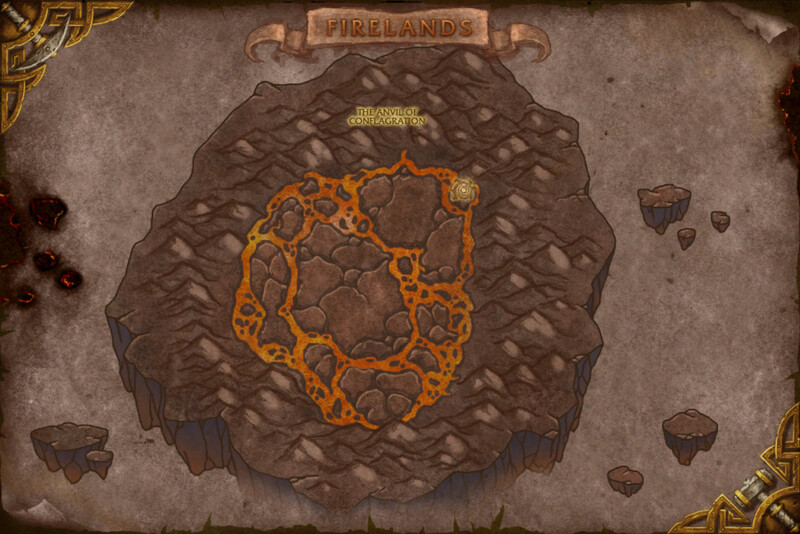 It is part of Patch 4.2 of World of Warcraft: Cataclysm and it represents Tier 12, in terms of progression. This raid instance is of a rare design, as most of it is in an outdoor setting. It houses 7 boss encounters, all of which are available on both normal and heroic difficulty. The instance also houses a great number of trash packs, for which we have written a specific guide, with the intent to prevent your raid from wiping on these packs. In addition to giving you access to loot dropped by the 7 bosses and the trash, it also plays a key role in obtaining Dragonwrath, Tarecgosa's Rest, a powerful item of legendary quality, as well as housing The Avengers of Hyjal faction, from which epic gear (item level 378 and 391) can be bought based on reputation levels. For all loot added in Patch 4.2, please refer to our Gear Listing for Patch 4.2. Killing these 5 bosses grants access to the Anvil of Conflagration. 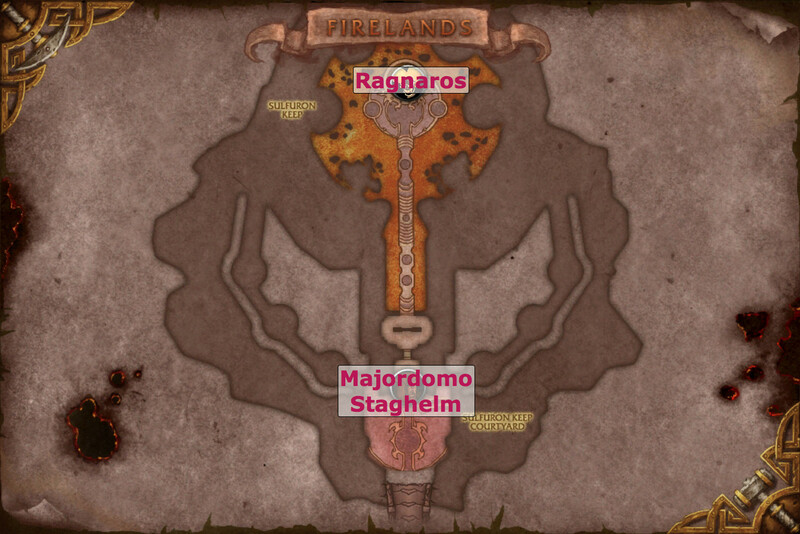 This is the location for one of the events which is part of the legendary quest chain for obtaining Dragonwrath, Tarecgosa's Rest. Your raid will need to overcome several challenges during this event. 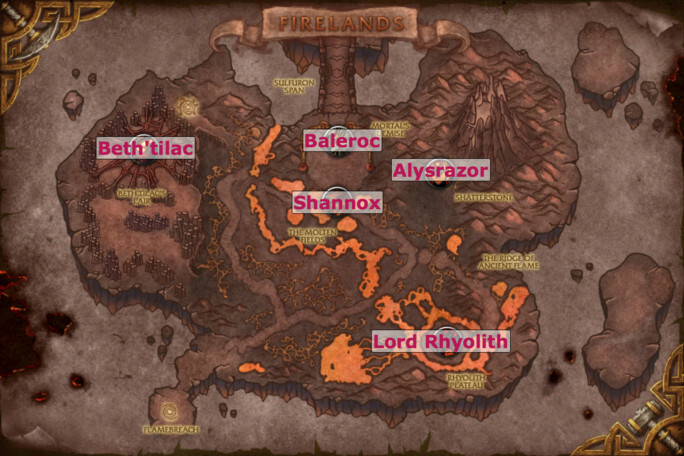 The last level of the Firelands is the Sulfuron Keep where Majordomo Staghelm and Ragnaros can be found.